Since the time i had received Agenda Builder for SAP TechEd 2016 – Bangalore edition, I was sure that there would be plenty of learning. I was not disappointed during the full 3 days at the event. Right from the Key note until the time when AppSpace hit magic number of 4957 apps on last day, learning journey was amazing. With SCN moving to new SAP Community, thought this is the best time to share some of my learning to the community. Data is the new gold & Oil. 50 billion sensor enabled devices by 2020 according to Cisco. Every hour, one million devices are added. Data is becoming infinite and it is the final frontier. Various source of data from which this has to be read to bring out meaningful value. SAP provides this freedom by the following products which help business free itself from chains of Legacy IT. Jump starting the development journey which is offered for free. Can be run on Laptop, desktop, any cloud upto 32 GB of memory. Free to access SAP HANA. Subscription in future to increase the memory and different features. Reporting based data intelligence with a definition of cube and it is static. A predefined static cube is not efficient. Instead flexibility in real time is order of the day. Dynamic outcome is the demand from the flexible business information warehouse. SAP’s next generation warehousing product built for S4HANA. It is built for Simplicity & Openness, Modern UX and High performance. Two phases to understand and realize the system conversion to S/4HANA. Discover/Prepare Phase and Realize Phase. Maintenance planner helps to migrate from SAP ERP system to S/4 HANA system. Prechecks are carried out to find the mandatory steps for conversion. With S/4 HANA 1610 release, complete Fiori theming coverage is present for both On premise and cloud. Scope is there for the complex transactions as well. Award winning Device agnostic responsive user experience for Business applications. SAP partnered with Apple to concentrate on the enterprise applications running on IoS. Though this is in industry for last 20 odd years, right now time is prime to utilize the full potential along with the technical capabilities. Enterprise Bots are the next paradigm shift after smartphones. Focus is to make enterprise applications more and more intelligent. Co-Pilot, Brand Monitoring, CV Matching, Invoice matching etc are few instances where Machine learning is applied within SAP. New consumer behavior is the personalized product & personalized production. Mass individualization at lower cost. Connected Logistics is the watch word today. At this digital age, it is also important to basically predict everything. Real time information is required for the predictive analysis. After Keynote, it was up to me to hop onto different lectures, Mini theater sessions, Hands on sessions etc to learn various things. Mostly i went through SAP Fiori 2.0 sessions, HCP, Smart Data streaming, SAP Hana cloud integration hands on session, Embedded Analytics etc. I will summarize my learning with few slides from the sessions. One unique experience for the end users. SAP Fiori is the front end of all business applications going forward. Single entry point using SAP Fiori Launchpad, Domain specific information using OVPs, Detail views, Native IOS. SAP Fiori home page which will Role based, Personalized, real time and aggregation point to access business applications and analytics. View port, ME Area, Global Settings, Notifications, App Finder, Co-Pilot etc are the eye candies in the new face of Fiori 2.0. Fiori elements have floorplans which incorporate latest SAP Fiori design and UX. List report page Template allow the users to have the annotated Odata services to create fully functional front end application with no front end coding. Analytics are seamlessly embedded in SAP Fiori using Analytic cards. SAP Fiori theme is incorporated for Classic UI which are used. SAP Fiori elements are introduced to achieve consistency in UI across the applications. 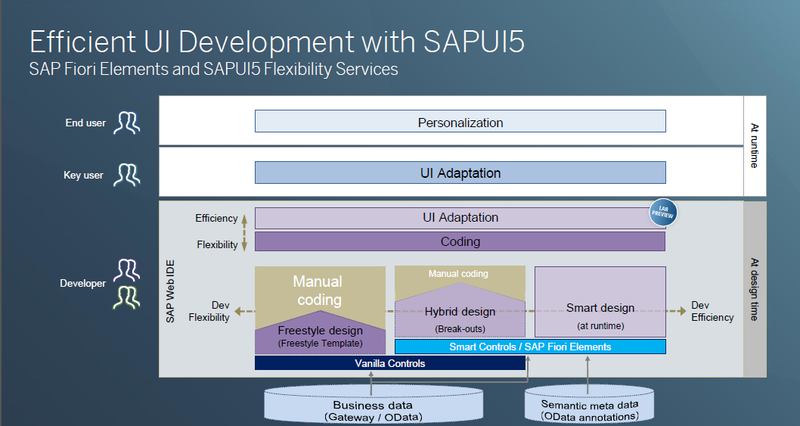 SAP UI5 views are rendered at run time with the combination of semantic information provided by the application developer and application templates provided by central template development team. Annotations are created by adding semantics to OData model. These Annotations are later consumed in the UI without actually generating nil or minimum UI code. List Report views, Object pages and Overview pages form integral part of SAP Fiori Elements. Traditionally OLTP & OLAP systems are separated to have reporting generated from the warehousing systems. Data is extracted from the systems and Analytics is done on top of the data. Reports will only be present in the BW systems and they are never real time reports. 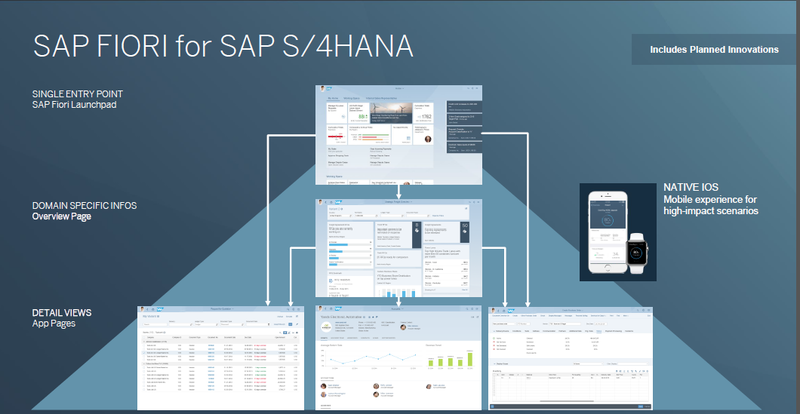 For this in SAP S/4 HANA, embedded analytics have come up with the use of Virtual data models. There is no Latency, no data duplication and to top it, this is always Ready To use Content. Different Standard VDMs are created for different business objects. Different objects like Sales order / Configuration can be combined to create CDS models. Once the CDS models are generated, BEX query can be generated and used in Analytic applications like Query browser to get real time analytics insight. These CDS models can be consumed in Lumira and other analytics applications present already. Innovation is an important thing to keep the future businesses running. There are different dimensions of Innovations which is Extending Business’s REACH and Extending Business’s SCOPE. Reaching more users, more devices, any location and no downtime. Scoping new UX, new functionality, new data and analytics. SAP HCP provides fast innovation with minimal risk and cost to focus on B2C scenarios. B2C scenarios will shape business’s future since customer should be able to access applications anytime, anywhere. SAP HCP , the PaaS for powering cloud applications achieve this by allowing end users to EXTEND, INTEGRATE and BUILD. Integration of On premise SAP backend on SAP HCP comes in two flavours, which are Data replication scenario and Point-to-Point connectivity scenario. SAP HANA Cloud Connector, a reverse proxy dispatcher plays an important role in these extensions scenarios. This is an important step to enable the customers, end users and partners to have their applications built and keep them running in SAP HCP. SAP HANA Smart Data streaming analyzes and act on data in real-time. SAP HANA SDS is able to process live stream events, analyze data in motion & act accordingly in real-time. Streaming analytics is essential to bring real time context to the apps – Forrester. SAP is rated among the leaders in 2016 Forrester Wave: Big Data Streaming Analytics. SDS is Scalable, low latency, has built in Predictive models based on machine learning, secure and Fault Tolerant. Data sources are streamed in from Sensors, Click streams, Social media, transactions etc. SDS runs as a service on SAP HCP which can be fed to different dashboards, applications, alert mechanisms. Machine Learning is the science of getting computers act without being explicitly programmed. Relevance of ML comes to stream analytics mainly due to incorporation of current data into prediction algorithms immediately. Adaptive Hoeffding Tree and Denstream (Clustering) algorithms are used in SAP HANA SDS. These are few topics which i had attended, although there are many more topics which were covered and also attended by me, these topics had more significance in terms of my learning process. Especially the likes of SAP S/4 HANA Master data migration prechecks, Smart Templates (Now Fiori elements) extension, SAP HCI integration services, App Space (Where Bangalore beats Vegas hands down with 4957 apps and hands over baton to Barcelona now) were memorable. I hope to continue the learning journey through the exciting times ahead. Thanks SAP TechEd 2016 organizers and track managers. I had a great time in the event. This is a very impressive blog and covers most of the topics presented at TechED Bangalore. Keep up the good work to blogging and spreading the knowledge.